Hydrogen fuel cells are a promising technology for producing clean and renewable energy, but the cost and activity of their cathode materials is a major challenge for commercialization. Many fuel cells require expensive platinum-based catalysts–substances that initiate and speed up chemical reactions–to help convert renewable fuels into electrical energy. To make hydrogen fuel cells commercially viable, scientists are searching for more affordable catalysts that provide the same efficiency as pure platinum. Taking part in this worldwide search for fuel cell cathode materials, researchers at the University of Akron developed a new method of synthesizing catalysts from a combination of metals–platinum and nickel–that form octahedral (eight-sided) shaped nanoparticles. While scientists have identified this catalyst as one of the most efficient replacements for pure platinum, they have not fully understood why it grows in an octahedral shape. To better understand the growth process, the researchers at the University of Akron collaborated with multiple institutions, including Brookhaven and its NSLS-II. Using the ultrabright x-rays at NSLS-II and the advanced capabilities of NSLS-II’s In situ and Operando Soft X-ray Spectroscopy (IOS) beamline, the researchers revealed the chemical characterization of the catalyst’s growth pathway in real time. Their findings are published in Nature Communications. Rather than colors, the scientists were identifying chemical information on the surface of the catalyst and comparing it to its interior. They discovered that, during the growth reaction, metallic platinum forms first and becomes the core of the nanoparticles. Then, when the reaction reaches a slightly higher temperature, platinum helps form metallic nickel, which later segregates to the surface of the nanoparticle. In the final stages of growth, the surface becomes roughly an equal mixture of the two metals. This interesting synergistic effect between platinum and nickel plays a significant role in the development of the nanoparticle’s octahedral shape, as well as its reactivity. The findings depended on the advanced capabilities of IOS, where the researchers were able to run the experiments at gas pressures higher than what is usually possible in conventional XPS experiments. “At IOS, we were able to follow changes in the composition and chemical state of the nanoparticles in real time during the real growth conditions,” said Waluyo. Additional x-ray and electron imaging studies completed at the Advanced Photon Source (APS) at DOE’s Argonne National Laboratory–another DOE Office of Science User Facility–and University of California-Irvine, respectively, complemented the work at NSLS-II. According to Utschig, the Z-scheme—which is the technical name for the light-triggered electron transport chain of natural photosynthesis that occurs in the thylakoid membrane—and the synthetic catalyst come together quite elegantly. “The beauty of this design is in its simplicity—you can self-assemble the catalyst with the natural membrane to do the chemistry you want,” she said. The next step for the research, according to Utschig, involves incorporating the membrane-bound Z-scheme into a living system. “Once we have an in vivo system—one in which the process is happening in a living organism—we will really be able to see the rubber hitting the road in terms of hydrogen production,” she said. Imagine if you could look at a small amount of an unidentified chemical element – less than 100 atoms in size – and know what type of material the element would become in large quantities before you actually saw the larger accumulation. That thought has long animated the work of Julius Jellinek, senior scientist emeritus in the Chemical Sciences and Engineering division at the U.S. Department of Energy’s (DOE) Argonne National Laboratory. His recent discovery with longtime collaborator Koblar Jackson, a professor in the Department of Physics at Central Michigan University, has the potential to dramatically impact the discipline of nanoscale science. According to Jellinek, the classification of elements and materials in bulk quantities into different types – metals, semiconductors and insulators – is well established and understood. But the identification of types of materials on the nanoscale is not so straightforward. In fact, even though the term “nanomaterials” is broadly used, nanoscale materials science has yet to be fully developed. “Elements and compounds in very small quantities, or nano-quantities, behave very differently from their bulk counterparts,” Jellinek explained. For example, small atomic clusters of elements that are metals in bulk quantities only take on metallic characteristics as they grow in size. This phenomenon is known as size-induced transition to metallicity, and it prompted Jellinek and Jackson to ask: Is it possible to predict what type of material an unidentified element will be in bulk quantities solely based on the properties it exhibits over a limited range of the sub-nano to nano size régime? Moreover, if an unidentified element will be a metal in bulk, using the same small-size polarizability data one can establish its exact chemical identity. The new scaling equations make it easy and straightforward for scientists to determine the polarizability of any size cluster of any metallic element based on the element’s corresponding bulk polarizability. In the past, this would have required lengthy – and costly – calculations for each individual case. “What would have taken days, weeks or even months to cover a range of sizes now takes a fraction of a second using these universal equations,” Jellinek said. For Jellinek personally, after more than 31 years at Argonne and having recently assumed an emeritus position, the discovery was particularly satisfying – and surprising, because originally he and Jackson were expecting to find something else. OAK RIDGE, Tenn., Sept. 25, 2018—A unique combination of imaging tools and atomic-level simulations has allowed a team led by the Department of Energy’s Oak Ridge National Laboratory to solve a longstanding debate about the properties of a promising material that can harvest energy from light. The researchers used multimodal imaging to “see” nanoscale interactions within a thin film of hybrid organic–inorganic perovskite, a material useful for solar cells. They determined that the material is ferroelastic, meaning it can form domains of polarized strain to minimize elastic energy. This finding was contrary to previous assumptions that the material is ferroelectric, meaning it can form domains of polarized electric charge to minimize electric energy. “We found that people were misguided by the mechanical signal in standard electromechanical measurements, resulting in the misinterpretation of ferroelectricity,” said Yongtao Liu of ORNL, whose contribution to the study became a focus of his PhD thesis at the University of Tennessee, Knoxville (UTK). The findings, reported in Nature Materials, revealed that differential strains cause ionized molecules to migrate and segregate within regions of the film, resulting in local chemistry that may affect the transport of electric charge. The understanding that this unique suite of imaging tools enables allows researchers to better correlate structure and function and fine-tune energy-harvesting films for improved performance. For their experiment, the researchers made a thin film by spin-casting a perovskite on an indium tin oxide–coated glass substrate. This process created the conductive, transparent surface a photovoltaic device would need—but also generated strain. To relieve the strain, tiny ferroelastic domains formed. One type of domain was “grains,” which look like what you might see flying over farmland with patches of different crops skewed in relation to one another. Within grains, sub-domains formed, similar to rows of two plant types alternating in a patch of farmland. These adjacent but opposing rows are “twin domains” of segregated chemicals. The technique that scientists previously used to claim the material was ferroelectric was piezoresponse force microscopy (“piezo” means “pressure), in which the tip of an atomic force microscope (AFM) measures a mechanical displacement due to its coupling with electric polarization—namely, electromechanical displacement. “But you’re not actually measuring the true displacement of the material,” Ovchinnikova warned. “You’re measuring the deflection of this whole ‘diving board’ of the cantilever.” Therefore, the researchers used a new measurement technique to separate cantilever dynamics from displacement of the material due to piezoresponse—the Interferometric Displacement Sensor (IDS) option for the Cypher AFM, developed by co-author Roger Proksch, CEO of Oxford Instruments Asylum Research. They found the response in this material is from cantilever dynamics alone and is not a true piezoresponse, proving the material is not ferroelectric. “Our work shows the effect believed due to ferroelectric polarization can be explained by chemical segregation,” Liu said. The study’s diverse microscopy and spectroscopy measurements provided experimental data to validate atomic-level simulations. The simulations bring predictive insights that could be used to design future materials. “We’re able to do this because of the unique environment at CNMS where we have characterization, theory and synthesis all under one roof,” Ovchinnikova said. Collaborations with industry allow ORNL to have unique tools available for scientists, including those that settled the debate about the true nature of the light-harvesting material. For example, an instrument that uses helium ion microscopy (HIM) to remove and ionize molecules was coupled with a secondary ion mass spectroscopy (SIMS) to identify molecules based on their weights. The HIM-SIMS instrument ZEISS ORION NanoFab was made available to ORNL from developer ZEISS for beta testing and is one of only two such instruments in the world. Similarly, the IDS instrument from Asylum Research, which is a laser Doppler vibrometer, was also made available to ORNL for beta testing and is the only one in existence. The research was supported by ORNL’s Laboratory Directed Research and Development Program and conducted at CNMS, a DOE Office of Science User Facility at ORNL. UT-Battelle manages ORNL for DOE’s Office of Science. The single largest supporter of basic research in the physical sciences in the United States, the Office of Science is working to address some of the most pressing challenges of our time. For more information, please visit https://science.energy.gov/. Nevertheless, we are still waiting for a true market impact. Quantum computing and graphene have been around for decades and still haven’t hit on their “killer app.” Perovskite solar cells and CRISPR are newer, but haven’t really impacted their industries yet. And those are just the most prominent examples. The problem isn’t necessarily with the discoveries themselves, many of which are truly path-breaking, but that there’s a fundamental difference between discovering an important new phenomenon in the lab and creating value in the marketplace. The gap between discovery and commercialization is so notorious and fraught with danger that it’s been unaffectionately called the “Valley of Death.” Part of the problem is that you can’t really commercialize a discovery, you can only commercialize a product and those are two very different things. The truth is that innovation is never a single event, but a process of discovery, engineering and transformation. After something like graphene is discovered in the lab, it needs to be engineered into a useful product and then it has to gain adoption by winning customers in the marketplace. Those three things almost never happen in the same place. So to bring an important discovery to market, you first need to identify a real world problem it can solve and connect to engineers who can transform it into a viable product or service. Then you need to find customers who are willing to drop whatever else they’ve been doing and adopt it on a large scale. That takes time, usually about 30 years. The reason it takes so long is that there is a long list of problems to solve. To create a successful business based on a scientific discovery, you need to get scientists to collaborate effectively with engineers and a host of specialists in other areas, such as manufacturing, distribution and marketing. Those aren’t just technology problems, those are human problems. Being able to collaborate effectively is often the most important competitive advantage. One of the most effective programs for helping to bring discoveries out of the lab is I-Corps. First established by the National Science Foundation (NSF) to help recipients of SBIR grants identify business models for scientific discoveries, it has been such an extraordinary success that the US Congress has mandated its expansion across the federal government. Based on Steve Blank’s lean startup methodology, the program aims to transform scientists into entrepreneurs. It begins with a presentation session, in which each team explains the nature of their discovery and its commercial potential. It’s exciting stuff, pathbreaking science with real potential to truly change the world. The thing is, they invariably get it wrong. Despite their years of work to discover something of significance and their further efforts to apply and receive commercialization grants from the federal government, they fail to come up with a viable application in an industry that wants what they have to offer. Ironically, much of the success of the I-Corps program is due to these early sessions. Once they realize that they are on the wrong track, they embark on a crash course of customer discovery, interviewing dozens — and sometimes hundreds — of customers in search of a business model that actually has a chance of succeeding. What’s startling about the program is that, without it, scientists with important discoveries often wasted years trying to make a business work that never really had a chance in the first place. Much of the success of Silicon Valley has been based on venture-funded entrepreneurship. Startups with an idea to change the world create an early stage version of the product they want to launch, show it to investors and get funding to bring it to market. Just about every significant tech company was started this way. Yet most of the success of Silicon Valley has been based on companies that sell either software or consumer gadgets, which are relatively cheap and easy to rapidly prototype. Many scientific startups, however, do not fit into this category. Often, they need millions of dollars to build a prototype and then have to sell to industrial companies with long lead times. The myth of Silicon Valley is that venture-funded entrepreneurship is a generalizable model that can be applied to every type of business. It is not. In fact, it is a specific model that was conceived in a specific place at a specific time to fund mature technologies for specific markets. It’s not a solution that fits every problem. The truth is that venture funds are very adept with assessing market risk, but not so good at taking on technology risk, especially in hard sciences. That simply isn’t what they were set up to do. In 1945, Vannevar Bush delivered a report, Science, The Endless Frontier, to President Truman, in which he made the persuasive argument that expanding the nation’s scientific capacity will expand its economic capacity and well being. His call led, ultimately, to building America’s scientific infrastructure, including programs like the NSF and the National Institutes of Health (NIH). It was Bush’s vision that made America a technological superpower. Grants from federal agencies to scientists enabled them to discover new knowledge. Then established businesses and, later, venture backed entrepreneurs would then take those discoveries to bring new products and services to market. Look at any industry today and its most important technologies were largely shaped by investment from the federal government. Today, however, the challenges are evolving. We’re entering a new era of innovation in which technologies like genomics, nanotechnology and robotics are going to reshape traditional industries like energy, healthcare and manufacturing. That’s exciting, but also poses new challenges, because these technologies are ill-suited to the Silicon Valley model of venture-funded entrepreneurship and need help to them get past the Valley of Death. So we need to build a new innovation ecosystem on top of the scientific architecture Bush created for the post-war world. There have been encouraging signs. New programs like I-Corps, the Manufacturing Institutes, Cyclotron Road and Chain Reaction are beginning to help fill the gap. Still much more needs to be done, especially at the state and local level to help build regional hubs for specific industries, if we are going to be nearly as successful in the 21st century as were were in the 20th. An electron beam (teal) hits a nanodiamond, exciting plasmons and vibrations in the nanodiamond that interact with the sample’s nitrogen vacancy center defects. Correlated (yellow) photons are emitted from the nanodiamond, while uncorrelated (yellow) photons are emitted by a nearby diamond excited by surface plasmons (red). Scientists at the Department of Energy’s Oak Ridge National Laboratory are conducting fundamental physics research that will lead to more control over mercurial quantum systems and materials. Their studies will enable advancements in quantum computing, sensing, simulation, and materials development. The researchers’ experimental results were recently published in Physical Review B Rapid Communication and Optics Letters. Quantum information is considered fragile because it can be lost when the system in which it is encoded interacts with its environment, a process called dissipation. Scientists with ORNL’s Computing and Computational Sciences and Physical Sciences directorates and Vanderbilt University have collaborated to develop methods that will help them control — or drive — the “leaky,” dissipative behavior inherent in quantum systems. Bringing perspectives from quantum information science, nanoscience and electron microscopy, the scientists exploit existing knowledge of matter and the physics of light and sound to examine the quantum nature of nanostructures — structures that measure about one-billionth of a meter. One project focused on driving nitrogen vacancy center defects in nanodiamonds with plasmons. The naturally occurring defects are created when a nitrogen atom forms in place of the typical carbon atom, adjacent to an atomless vacancy. The defects are being investigated for use in tests of entanglement, a state that will allow substantially more information to be encoded in a quantum system than can be accomplished with classical computing. Electrons generate an electric field. When an electron beam is applied to a material, the material’s electrons are spurred to motion — a state called excitation — creating a magnetic field that can then be detected as light. Working with plasmons, electron excitations that couple easily with light, allows scientists to examine electromagnetic fields at the nanoscale. Matthew Feldman, a Vanderbilt University graduate student conducting doctoral research at ORNL through the National Defense Science and Engineering Graduate Fellowship program and a member of the Quantum Sensing Team, used a high-energy electron beam to excite nitrogen vacancy centers in diamond nanoparticles, causing them to emit light. He then used a cathodoluminescence microscope owned by ORNL’s Materials Science and Technology Division, which measures the visible-spectrum luminescence in irradiated materials, to collect the emitted photons and characterize high-speed interactions among nitrogen vacancy centers, plasmons and vibrations within the nanodiamond. In other research, Jordan Hachtel, a postdoctoral fellow with ORNL’s Center for Nanophase Materials Sciences, used the cathodoluminescence microscope to excite plasmons in gold nanospirals. He explored how the geometry of the spirals could be harnessed to focus energy in nanoscale systems. Andy Lupini served the project as a microscopy consultant, providing expertise regarding equipment optimization and troubleshooting. Precise control over nanoscale energy transfer is required to enable long-lived entanglement in a model explored by Eugene Dumitrescu, a research scientist in ORNL’s Quantum Information Science Group. Dumitrescu’s research, published in Physical Review A in late 2017, showed that the photon statistics Feldman collected could be used in calculations to show entanglement. “This work advances our knowledge of how to control light-matter interactions, providing experimental proof of a phenomenon that had previously been described by simulations,” Lawrie said. Closed systems, in which quantum information can be kept away from its surroundings, theoretically can prevent dissipation, but real-world quantum systems are open to numerous influences that result in information leakage. Feldman thinks these are fascinating times for quantum physicists because the field of quantum computing is at the same phase classical computing was in the mid-20th century. “What excites me most is how current research could change our understanding of quantum systems and materials,” he said. Materials provided by DOE/Oak Ridge National Laboratory. Note: Content may be edited for style and length. America’s National Laboratories have been changing and improving the lives of millions of people for more than 75 years. Born at a time when the world faced a dire threat, the laboratories came together to advance science, safeguard the nation and protect our freedoms for generations to come. This network of Department of Energy Laboratories has grown into 17 facilities, working together as engines of prosperity and invention. As this list of breakthroughs attests, Laboratory discoveries have spawned industries, saved lives, generated new products, fired the imagination and helped to reveal the secrets of the universe. Rooted in the need to serve the public good and support the global community, the National Laboratories have put an American stamp on the last century of science. With equal ingenuity and tenacity, they are now engaged in innovating the future. Download and read 75 Breakthroughs by America’s National Laboratories. The National Labs operate some of the most significant high performance computing resources available, including 32 of the 500 fastest supercomputers in the world. These systems, working at quadrillions of operations per second, model and simulate complex, dynamic systems – such as the nuclear deterrent – that would be too expensive, impractical or impossible to physically demonstrate. Supercomputers are changing the way scientists explore the evolution of our universe, climate change, biological systems, weather forecasting and even renewable energy. In 1990, the National Labs joined with the National Institutes of Health and other laboratories to kick off the Human Genome Project, an international collaboration to identify and map all of the genes of the human genome. National Lab scientists, seeking to share particle physics information, were first to install a web server in North America, kick-starting the development of the worldwide web as we know it. Vela satellites, first launched in 1963 to detect potential nuclear detonations, transformed the nascent U.S. space program. The satellites featured optical sensors and data processing, logic and power subsystems designed and created by National Labs. Researchers at the National Labs helped to develop the field of nuclear medicine, producing radioisotopes to diagnose and treat disease, designing imaging technology to detect cancer and developing software to target tumors while sparing healthy tissue. The National Labs built the enclosure for the radioisotope thermoelectric generators that fuel crafts such as Cassini and have begun producing plutonium-238 for future NASA missions. National Lab scientists and engineers have led the world in developing safe, efficient and emissions-free nuclear power. Starting with the first nuclear reactor to generate electricity, National Labs have been the innovation engine behind the peaceful use of nuclear energy. Today’s labs are supporting the next generation of nuclear power that will be available for the nation and world. Removing arsenic from drinking water is a global priority. A long-lasting particle engineered at a National Lab can now do exactly that, making contaminated water safe to drink. Another technology developed at a National Lab uses ultraviolet light to kill water-borne bacteria that cause dysentery, thus reducing child mortality in the developing world. National Lab X-ray facilities have contributed a large portion of more than 100,000 protein structures in the Protein Data Bank. A protein’s structure reveals how it functions, helping scientists understand how living things work and develop treatments for disease. Almost all new medications that hit the market start with these data bank structures. National Labs provide the theory, tools and techniques that offer industry revolutionary materials such as strong, lighter-weight metals and alloys that save fuel and maintenance costs and enable cleaner, more efficient engines. National Lab scientists discovered how genetic instructions are carried to the cell’s protein manufacturing center, where all of life’s processes begin. Subsequent light source research on the genetic courier, called messenger RNA, has revealed how the information is transcribed and how mistakes can cause cancer and birth defects. Credit for producing 3D maps of the sky — and 400 million celestial objects — goes to National Lab scientists, who also developed a camera that mapped the entire surface of the moon. Ever wonder how plants turn sunlight into energy? National Lab scientists determined the path of carbon through photosynthesis, and today use X-ray laser technology to reveal how each step in the process is triggered by a single particle of light. This work helps scientists explore new ways to get sustainable energy from the sun. The works of ancient mathematician Archimedes — written over by medieval monks and lost for millennia — were revealed to modern eyes thanks to the X-ray vision and light-source technology at National Labs. These studies also have revealed secrets of masterpiece paintings, ancient Greek vases and other priceless cultural artifacts. A National Lab built and operated the first large-scale accelerator based on superconducting radio frequency technology. This more efficient technology now powers research machines for exploring the heart of matter, examining the properties of materials and providing unique information about the building blocks of life. Protons and neutrons were once thought to be indivisible. National Lab scientists discovered that protons and neutrons were made of even smaller parts, called quarks. Over time, experimenters identified six kinds of quarks, three types of neutrinos and the Higgs particle, changing our view of how the material world works. National Lab detectors aboard a NASA satellite revealed the birth of galaxies in the echoes of the Big Bang. Dark energy — the mysterious something that makes up three-quarters of the universe and causes it to expand at an accelerating rate — also was discovered by National Lab cosmologists. The periodic table would be smaller without the National Labs. To date the National Labs have discovered: technetium, promethium, astatine, neptunium, plutonium, americium, curium, berkelium, californium, einsteinium, fermium, mendelevium, nobelium, lawrencium, rutherfordium, dubnium, seaborgium, flerovium, moscovium, livermorium, tennessine and oganesson. Next-generation refrigerators will likely put the freeze on harmful chemical coolants in favor of an environmentally friendly alloy, thanks to National Lab scientists. Removing hazardous lead-based solders from the environment is a reality thanks to a lead-free alloy of tin-silver-copper developed at a National Lab. The lead-free solder has been licensed by more than 60 companies worldwide. National Lab scientists used a nano technique to invent a new sponge that can absorb 90 times its own weight in oil from water. It can be wrung out to collect the oil and reused hundreds of times — and it can collect oil that has sunk below the surface, something previous technology couldn’t do. High-pressure gas atomization processing pioneered at a National Lab made possible the production of titanium and other metal-alloy powders used in additive manufacturing and powder metallurgy. Low-cost catalysts are key to efficient biomass refining. National Lab scientists created catalysts that are inexpensive and stable for biomass conversion. National Lab scientists created ways to reduce wear and tear in machines from table fans to car engines all the way up to giant wind turbines, such as a diamond-like film that rebuilds itself as soon as it begins to break down — so that engines last longer and need fewer oil additives. Chevy’s Volt would not be able to cruise on battery power were it not for the advanced cathode technology that emerged from a National Lab. The same technology is sparking a revival of America’s battery manufacturing industry. National Lab scientists have developed a novel and versatile material that blends properties of ceramic and concrete to form a non-porous product that can do everything from seal oil w ells to insulate walls with extra fire protection. It even sets in cold weather. New kinds of power lines made from superconductors can carry electric current with no energy loss. Now deployed by National Lab scientists, these prototypes could usher in a new era of ultra-efficient power transmission. National Lab scientists used a particle collider to recreate the primordial soup of subatomic building blocks that last existed shortly after the Big Bang. The research is expanding scientists’ understanding of matter at extreme temperatures and densities. Say goodbye to traffic jams. National Lab scientists developed a technology that uses the attractive and repulsive forces of magnets to levitate and propel trains. Maglev trains now ferry commuters in Japan and China and will be operational in other countries soon. National Lab researchers developed cleaner-combusting oil burners, saving consumers more than $25 billion in fuel costs and keeping more than 160 megatons of carbon dioxide out of Earth’s atmosphere. A company with National Lab roots is pioneering a metal that weighs significantly less than regular steel, retains steel’s strength and malleability and can be fabricated without major modifications to the automotive manufacturing infrastructure. National Lab researchers created a device that could identify the contents of suspicious chemical and explosive munitions and containers, while minimizing risk to the people involved. The technology, which quickly identifies the chemical makeup of weapons, has been used to verify treaties around the world. National Lab scientists began developing the Reactor Excursion and Leak Analysis Program (RELAP) to model nuclear reactor coolant and core behavior. Today, RELAP is used throughout the world and has been licensed for both nuclear and non-nuclear applications, including modeling of jet aircraft engines and fossil-fuel power plant components. The battle against heart disease received a boost in the 1960s when National Lab research unveiled the good and bad sides of cholesterol. Today, diagnostic tests that detect both types of cholesterol save lives. Natural history’s greatest whodunit was solved in 1980 when a team of National Lab scientists pinned the dinosaurs’ abrupt extinction on an asteroid collision with Earth. Case closed. National Lab researchers and policy experts led the way in analyzing and implementing cool roofing materials, which reflect sunlight, lower surface temperature and slash cooling costs. In a milestone that brings advanced biofuels one step closer to America’s gas tanks, National Lab scientists helped develop a microbe that can produce fuel directly from biomass. To replace gasoline, hydrogen must be safely stored and easy to use, which has proven elusive. National Lab researchers have now designed a new pliable material using nanoparticles that can rapidly absorb and release hydrogen without ill effects, a major step in making fuel-cell powered cars a commercial reality. You can sleep easier thanks to National Lab research that quantified the health risk posed by radon gas in parts of the country. Subsequent EPA standards, coupled with radon detection and mitigation measures pioneered by a National Lab research team, prevent the naturally occurring gas from seeping into basements, saving thousands of lives every year. A tool that identifies the microbes in air, water and soil samples is fast becoming a workhorse in public health, medical and environmental cleanup projects. Developed by National Lab scientists, the credit-card-sized device pinpoints diseases that kill coral reefs and catalogs airborne bacteria over U.S. cities. It also was used to quickly categorize the oil-eating bacteria in the plumes of the Deepwater Horizon spill. The world’s smallest synthetic motors — as well as radios, scales and switches that are 100,000 times finer than a human hair — were engineered at a National Lab. These and other forays into nanotechnology could lead to life-saving pharmaceuticals and more powerful computers. sound recordings that are too fragile to play, such as Edison wax cylinders from the late 1800s. Archivists estimate that many of the millions of recordings in the world’s sound archives, including the U.S. Library of Congress, could benefit from the technology. A credit-card sized detector developed by National Lab scientists can screen for more than 30 kinds of explosives in just minutes. The detector, called ELITE, requires no po wer and is widely used by the military, law enforcement and security personnel. A National Lab and industry technique for strengthening metal by bombarding it with laser pulses has saved the aircraft industry hundreds of millions of dollars in engine and aircraft maintenance expenses. Trains, planes and automobiles — and thousands of other objects — are safer, stronger and better-designed thanks to computer simulation software, DYNA 3D, developed by National Lab researchers. Starting with the Nobel-Prize winning discovery of the neutrino in 1956 by Fred Reines and Clyde Cowan Jr., National Lab researchers have made numerous contributions to neutrino physics and astrophysics. Sensors developed at the National Labs and placed aboard Vela satellites were used in the discovery of gamma-ray bursts (GRBs) in 1973. GRBs are extremely energetic explosions from distant galaxies. Scientists believe that most of these bursts consist of a narrow beam of intense radiation released when a rapidly rotating, high-mass star collapses to form a neutron star, a quark star or a black hole. National Lab scientists achieved a 100.75-Tesla magnetic pulse in March 2012, setting a world record. The pulse was nearly 2 million times more powerful than Earth’s magnetic field. The 100-Tesla multi-shot magnet can be used over and over again without being destroyed by the force of the field it creates, and produces the most powerful non-destructive magnetic field in the world. National Labs researchers perfected aerogels, known as frozen smoke. They are one of the lightest solids ever made and have the highest heat resistance of any material tested. They also are fireproof and extraordinarily strong — able to support more than a thousand times their own weight. As a result of their heat resistance, aerogels are outstanding candidates for insulation in buildings, vehicles, filters and appliances. During the 1960s, a National Lab physicist invented a “cell sorter” — a novel device that works much like an ink jet printer, guiding a tiny flow of cell-containing droplets so cells of interest can be deflected for counting and study. Cell sorters are a vital tool for studying the biochemistry behind many diseases, including cancer and AIDS. National Lab research jump-started the shale gas revolution by pointing the way to key technologies and methodologies for cost efficient extraction. An estimated $220 million in research and development expenditures on unconventional gas R&D from 1976 to 1992 have resulted in an estimated $100 billion in annual economic activity from shale gas production alone. National Labs invented Laser-Induced Breakdown Spectroscopy (LIBS), the backbone of the device that allowed the Curiosity Rover to analyze material from Mars. Lab researchers also found the right combination of materials to make high-efficiency solar cells for spacecraft. National Lab scientists introduced some 20 innovative technologies — such as low nitrogen oxide (NOx) burners, flue gas desulfurization (scrubbers) and fluidized bed combustion — through the Clean Coal Technology Development Program that have deeply penetrated the marketplace, substantially controlled harmful power plant emissions and benefited energy production and air quality. Increasing wind turbine efficiency with high efficiency airfoils has reduced the cost of wind power by more than 80 percent over the last 30 years. Now deployed in wind farms nationwide, these turbines owe their existence to National Lab research. National Lab scientists have created highly insulated windows that change color to modulate interior temperatures and lighting. If broadly installed, they could save about 5 percent of the nation’s total energy budget. National Lab researchers have developed computer models that effectively manage the complex logistical tasks of deploying troops and equipment to distant destinations. Integrated circuits and artificial hips owe their success to a National Lab discovery that revealed how to change a material by injecting it with charged atoms, called ions. Ion channeling is now standard practice in industry and science. A large-scale additive manufacturing platform developed by a National Lab and an industry partner printed 3D components 10 times larger and 200 times faster than previous processes. So far, the system has produced a 3D-printed sports car, SUV, house, excavator and aviation components. National Lab researchers adapted nuclear separations technology to develop a zonal centrifuge used to purify vaccines, which reduces or eliminates unwanted side effects. Commercial centrifuges based on the invention produce vaccines for millions of people. A National Lab has built one of the world’s most energy efficient office buildings. The facility, operating as a living laboratory at a lab site, uses 50 percent less energy than required by commercial codes and only consumes energy produced by renewable power on or near the building. Weapons, explosives, plastic devices and other concealed tools of terrorists are easier to detect thanks to technology developed at a National Lab and now installed in airports worldwide. A National Lab created an advanced battery that can store large amounts of energy from intermittent renewable sources — such as wind and solar — onto the power grid, while also smoothing over temporary disruptions to the grid. Several companies have licensed the technology and offer it as a commercial product. A National Lab insight into how catalysts behave paved the way for a new, “lean-burn” diesel engine that met emissions standards and improved fuel efficiency by 25 percent over conventional engines. A miniature device — commercialized by private industry after a National Lab breakthrough — generates enough power from small temperature changes to power wireless sensors or radio frequency transmitters at remote sites, such as dams, bridges and pipelines. Regulating the energy use of household appliances — especially at peak times — could slash energy demand and avoid blackouts. A National Lab appliance-control device senses grid stress and responds instantly to turn off machines and reduce end-use demand, balancing the system so that the power stays on. The optical digital recording technology behind music, video and data storage originated at a National Lab nearly 40 years ago. Disposal of U.S. Cold War waste is safer thanks to National Lab scientists who developed and deployed a process to lock it into glass to keep it from leaching into the environment. Scientists at a National Lab developed a non-toxic foam that neutralizes chemical and biological agents. This foam was used to clean up congressional office buildings and mail rooms exposed to anthrax in 2001. In 2014, researchers from a National Lab modeled the Liberian blood sample transport system and made recommendations to diagnose patients quicker. This minimized the amount of time people were waiting together, reducing the spread of Ebola. In 1960, National Lab scientists invented coded electromechanical locks for all U.S. nuclear weapons. The switch blocks the arming signal until it receives the proper presidential authorization code. In the 1990s, scientists at a National Lab saw the need for energy-efficient solid-state lighting and worked with industry to develop white LEDs. Today, white LEDs are about 30 percent efficient, with the potential to reach 70 percent to 80 percent efficiency. Fluorescent lighting is about 20 percent efficient and incandescent bulbs are 5 percent. National Lab scientists engineered and synthesized multi-layer semiconductor structures in devices that directly convert sunlight to chemical energy in hydrogen by splitting water at efficiencies greater than 15 percent. This direct conversion of sunlight to fuels paves the way for use of solar energy in applications beyond the electrical grid. From the first fusion test reactor to briefly produce power at the megawatt scale, and the world’s largest and most energetic laser creating extreme conditions mimicking the Big Bang, the interiors of planets and stars and thermonuclear weapons, to the international experiment to generate industrial levels of fusion energy from burning plasmas, fusion science and applications are advancing because of the National Labs. National Lab scientists have used ultrafast X-rays to capture the first molecular movies in quadrillionths-of-a-second frames. These movies detail the intricate structural dances of molecules as they undergo chemical reactions. For more than 75 years, the Department of Energy’s National Laboratories have solved important problems in science, energy and national security. This expertise keeps our nation at the forefront of science and technology in a rapidly changing world. Partnering with industry and academia, the laboratories also drive innovation to advance economic competitiveness and ensure our nation’s future prosperity. IDAHO FALLS — Advancements in a fuel cell technology powered by solid carbon could make electricity generation from resources such as coal and biomass cleaner and more efficient, according to a new paper published by Idaho National Laboratory researchers. The fuel cell design incorporates innovations in three components: the anode, the electrolyte and the fuel. Together, these advancements allow the fuel cell to utilize about three times as much carbon as earlier direct carbon fuel cell (DCFC) designs. The fuel cells also operate at lower temperatures and showed higher maximum power densities than earlier DCFCs, according to INL materials engineer Dong Ding. The results appear in this week’s edition of the journal Advanced Materials. Whereas hydrogen fuel cells (e.g., proton exchange membrane (PEM) and other fuel cells) generate electricity from the chemical reaction between pure hydrogen and oxygen, DCFCs can use any number of carbon-based resources for fuel, including coal, coke, tar, biomass and organic waste. Because DCFCs make use of readily available fuels, they are potentially more efficient than conventional hydrogen fuel cells. “You can skip the energy-intensive step of producing hydrogen,” Ding said. But earlier DCFC designs have several drawbacks: They require high temperatures — 700 to 900 degrees Celsius — which makes them less efficient and less durable. Further, as a consequence of those high temperatures, they’re typically constructed of expensive materials that can handle the heat. Also, early DCFC designs aren’t able to effectively utilize the carbon fuel. Ding and his colleagues addressed these challenges by designing a true direct carbon fuel cell that’s capable of operating at lower temperatures — below 600 degrees Celsius. The fuel cell makes use of solid carbon, which is finely ground and injected via an airstream into the cell. The researchers tackled the need for high temperatures by developing an electrolyte using highly conductive materials — doped cerium oxide and carbonate. These materials maintain their performance under lower temperatures. Next, they increased carbon utilization by developing a 3-D ceramic textile anode design that interlaces bundles of fibers together like a piece of cloth. The fibers themselves are hollow and porous. All of these features combine to maximize the amount of surface area that’s available for a chemical reaction with the carbon fuel. The molten carbonate carries the solid carbon into the hollow fibers and the pinholes of the anode, increasing the power density of the fuel cell. The resulting fuel cell looks like a green, ceramic watch battery that’s about as thick as a piece of construction paper. A larger square is 10 centimeters on each side. The fuel cells can be stacked on top of one another depending on the application. The Advanced Materials journal posted a video abstract here: https://youtu.be/M_wOsvze2qI. The technology has the potential for improved utilization of carbon fuels, such as coal and biomass, because direct carbon fuel cells produce carbon dioxide without the mixture of other gases and particulates found in smoke from coal-fired power plants, for example. This makes it easier to implement carbon capture technologies, Ding said. The advanced DCFC design has already attracted notice from industry. Ding and his colleagues are partnering with Salt Lake City-based Storagenergy, Inc., to apply for a Department of Energy Small Business Innovation Research (SBIR)-Small Business Technology Transfer (STTR) Funding Opportunity. The results will be announced in February 2018. A Canadian energy-related company has also shown interest in these DCFC technologies. Idaho National Laboratory is one of the U.S. Department of Energy’s national laboratories. The laboratory performs work in each of DOE’s strategic goal areas: energy, national security, science and environment. INL is the nation’s leading center for nuclear energy research and development. Day-to-day management and operation of the laboratory is the responsibility of Battelle Energy Alliance. The ability to quickly generate ultra-small, well-ordered nanopatterns over large areas on material surfaces is critical to the fabrication of next-generation technologies in many industries, from electronics and computing to energy and medicine. For example, patterned media, in which data are stored in periodic arrays of magnetic pillars or bars, could significantly improve the storage density of hard disk drives. Scientists can coax thin films of self-assembling materials called block copolymers—chains of chemically distinct macromolecules (polymer “blocks”) linked together—into desired nanoscale patterns through heating (annealing) them on a substrate. However, defective structures that deviate from the regular pattern emerge early on during self-assembly. 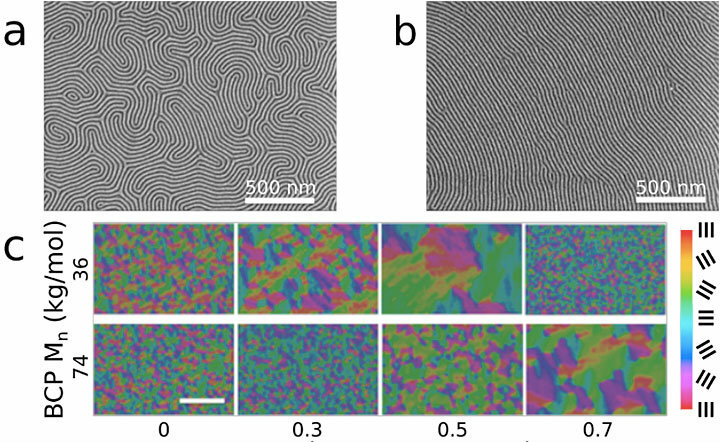 The presence of these defects inhibits the use of block copolymers in the nanopatterning of technologies that require a nearly perfect ordering—such as magnetic media, computer chips, antireflective surfaces, and medical diagnostic devices. With continued annealing, the block copolymer patterns can reconfigure to remove the imperfections, but this process is exceedingly slow. The polymer blocks do not readily mix with each other, so they must overcome an extremely large energy barrier to reconfigure. Doerk and coauthor Kevin Yager, leader of the Electronic Nanomaterials Group at CFN, used image analysis software to calculate the grain size and repeat spacing of the line patterns. While blending different concentrations of homopolymer to determine how much was needed to achieve the accelerated ordering, they discovered that the ordering sped up as more homopolymer was added. But too much homopolymer actually resulted in disordered patterns. 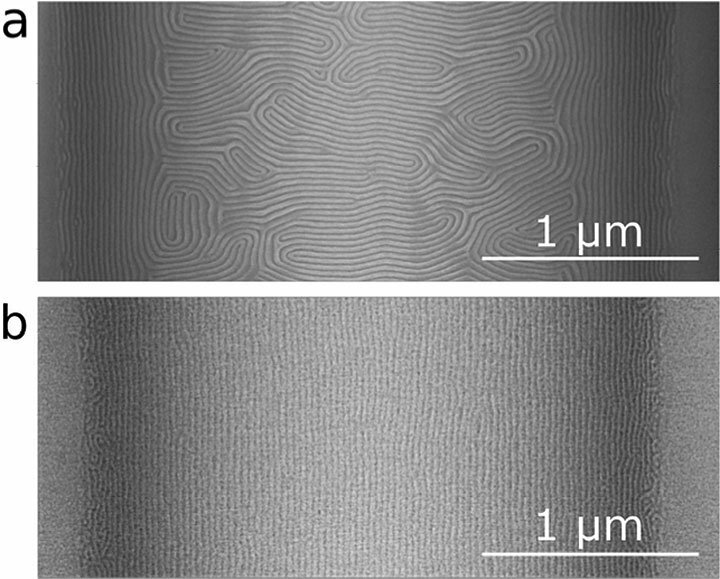 To demonstrate how the rapid ordering in the blended system could accelerate the self-assembly of well-aligned nanopatterns over large areas, Doerk and Yager used line-pattern templates they had previously prepared through photolithography. Used to build almost all of today’s digital devices, photolithography involves projecting light through a mask (a plate containing the desired pattern) that is positioned over a wafer (usually made of silicon) coated with a light-sensitive material. This template can then be used to direct the self-assembly of block copolymers, which fill in the spaces between the template guides. In this case, after only two minutes of annealing, the polymer blend self-assembles into lines that are aligned across these gaps. However, after the same annealing time, the unblended block copolymer self-assembles into a mostly unaligned pattern with many defects between the gaps. 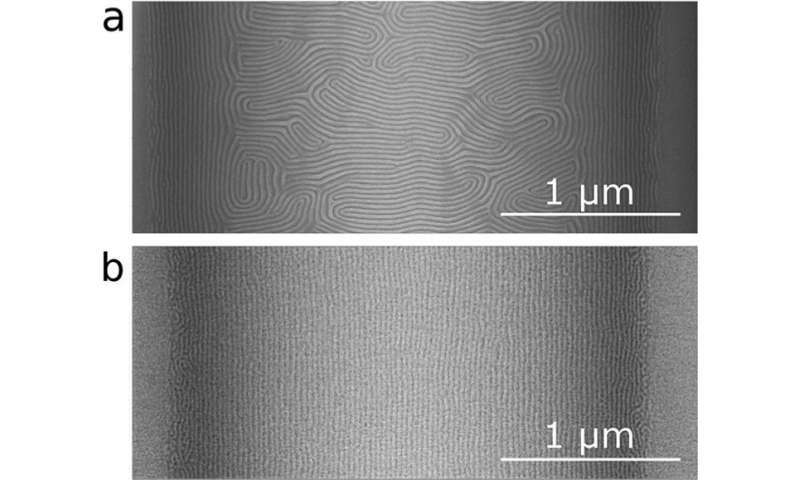 For these patterns to be useful for many nanopatterning applications, they often need to be transferred to other more robust materials that can withstand harsh manufacturing processes—for example, etching, which removes layers from silicon wafer surfaces to create integrated circuits or make the surfaces antireflective. In this study, the scientists converted the nanopatterns into a metal-oxide replica. Through chemical etching, they then transferred the replica pattern into a silicon dioxide layer on a silicon wafer, achieving clearly defined line patterns. Doerk suspects that blending homopolymers with other block copolymers will similarly yield accelerated assembly, and he is interested in studying blended polymers that self-assemble into more complicated patterns. The x-ray scattering capabilities at the National Synchrotron Light Source II—another DOE Office of Science User Facility at Brookhaven—could provide the structural information needed to conduct such studies. Berkeley Lab leads discovery of the fastest magnesium-ion solid-state conductor to date. The electrolyte, which carries charge back and forth between the battery’s cathode and anode, is a liquid in all commercial batteries, which makes them potentially flammable, especially in lithium-ion batteries. A solid-state conductor, which has the potential to become an electrolyte, would be far more fire-resistant. The material they came up with, magnesium scandium selenide spinel, has magnesium mobility comparable to solid-state electrolytes for lithium batteries. Their findings were reported in Nature Communications in a paper titled, “High magnesium mobility in ternary spinel chalcogenides.”JCESR, a DOE Innovation Hub, sponsored the study, and the lead authors are Pieremanuele Canepa and Shou-Hang Bo, postdoctoral fellows at Berkeley Lab. “With the help of a concerted effort bringing together computational materials science methodologies, synthesis, and a variety of characterization techniques, we have identified a new class of solid conductors that can transport magnesium ions at unprecedented speed,” Canepa said. “It was crucial to confirm the fast magnesium hopping experimentally. It is not often that the theory and the experiment agree closely with each other,” Key said. “The solid state NMR experiments for this chemistry were very challenging and would not be possible without dedicated resources and a funding source such as JCESR. Gopalakrishnan Sai Gautam, another co-author who was an affiliate at Berkeley Lab and is now at Princeton, said the team approach made possible by a DOE hub such as JCESR was critical. “The work shows the importance of using a variety of theoretical and experimental techniques in a highly collaborative environment to make important fundamental discoveries,” he said. Funding for the project was provided by the DOE Office of Science through the Joint Center for Energy Storage Research, a Department of Energy Innovation Hub. The Advanced Photon Source, a DOE Office of Science User Facility at Argonne, added vital data to the study regarding the structure of the solid conductor. The National Energy Research Scientific Computing Center (NERSC), a DOE Office of Science User Facility at Berkeley Lab, provided computing resources. Other co-authors on the paper are Juchaun Li of Berkeley Lab, William Richards and Yan Wang of MIT, and Tan Shi and Yaosen Tian of UC Berkeley. Argonne National Laboratory seeks solutions to pressing national problems in science and technology. The nation’s first national laboratory, Argonne conducts leading-edge basic and applied scientific research in virtually every scientific discipline. Argonne researchers work closely with researchers from hundreds of companies, universities, and federal, state, and municipal agencies to help them solve their specific problems, advance America’s scientific leadership, and prepare the nation for a better future. With employees from more than 60 nations, Argonne is managed by UChicago Argonne, LLC for the U.S. Department of Energy’s Office of Science.